The inspiration for this dish came from an advert on the TV talking about fajitas. I was unsure what to cook and just needed something quick, simple and healthy. Taking only 7 minutes to cook, I think this is the perfect mid-week meal. 1 Spray the oil in a cold wok or large frying pan, then place the pan on a med-high heat. 2 When the pan is hot, add the onions. Continuously stirring cook the onions for 30 seconds. 3 Then add the mushrooms and peppers, then stir. Cook for 1 minute stirring occasionally. 4 After 1 minute, add the garlic, smoked paprika, paprika, black pepper and chill flakes then stir. Leave to cook for another minute stirring occasionally. 5 Then add the black beans and stir, cook for 2 minutes. 6 Stir in the baby spinach stir and cook for 30 seconds. 7 Then add the tomatoes and coriander, stir and cook for 1 minute stirring occasionally. Then remove from the heat. 8 Place the wraps in the microwave and heat for 10-15 seconds. 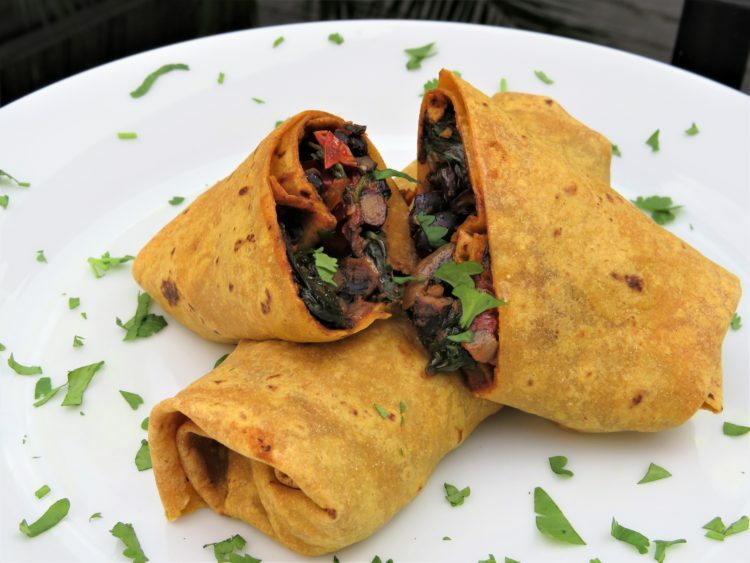 Then remove the wraps from the microwave, load each wrap with the smokey black bean filling, roll and enjoy. 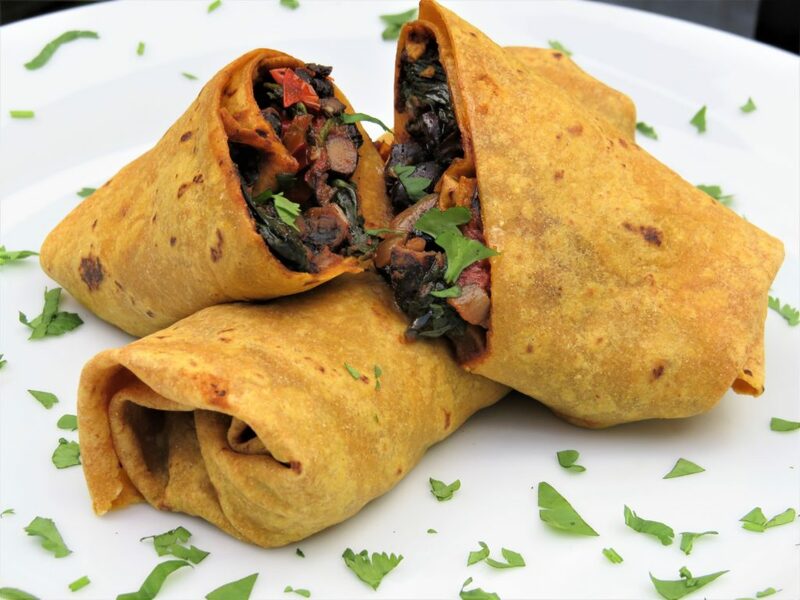 Hint: To serve, bring the pan to the table along with the warm wraps on another plate then help yourself. Black Beans helps prevent Alzheimer’s, keep a healthy heart and regulates blood sugar levels. They are high in vitamin-A, vitamin-B9 soluble fibre, protein, calcium, iron, manganese. They are a great source of folic acid and molybdenum-a rare mineral that breaks down sulphites found in wine and helps cell energy production. Cherry Tomatoes or Tomatoes contain protein, fibre, vitamin-C, vitamin-B6 important for brain function and vitamin-A which keeps your eyes, heart, lungs and kidneys working properly. Coriander is a good source of dietary fibre, potassium, calcium, manganese, iron, magnesium, folic acid, niacin, vitamin-A, vitamin-C and vitamin-K which helps with brain function and Alzheimer’s. 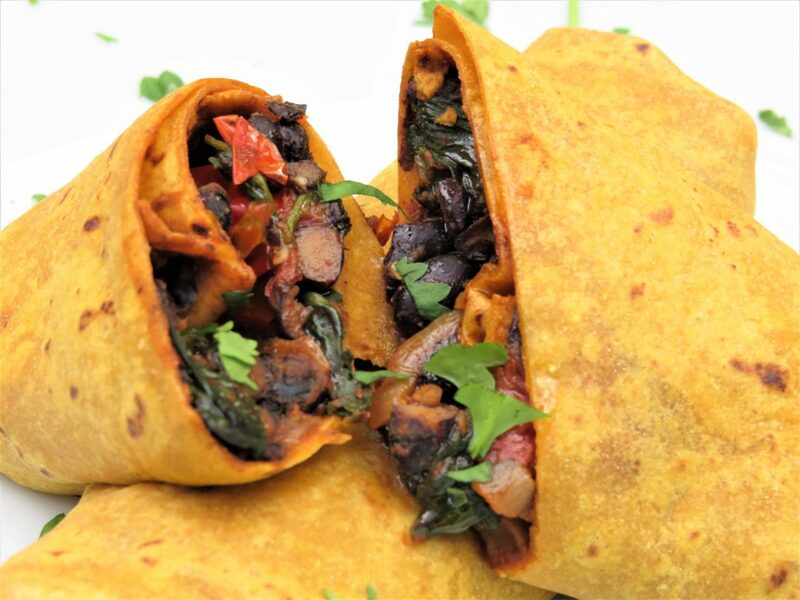 Made this delicious Blackbean in sweet potato wrap today. It was tasty and rather filling. I did have two wraps for myself. In one of the wraps I added grated cheese. Either way they both tasted scrumptious. I’m looking forward to trying out some of your other recipes. Hi Patricia, Thanks for trying my recipe and leaving a comment. I am so pleased you liked it! Next time I have vegan cheese I might try adding cheese.